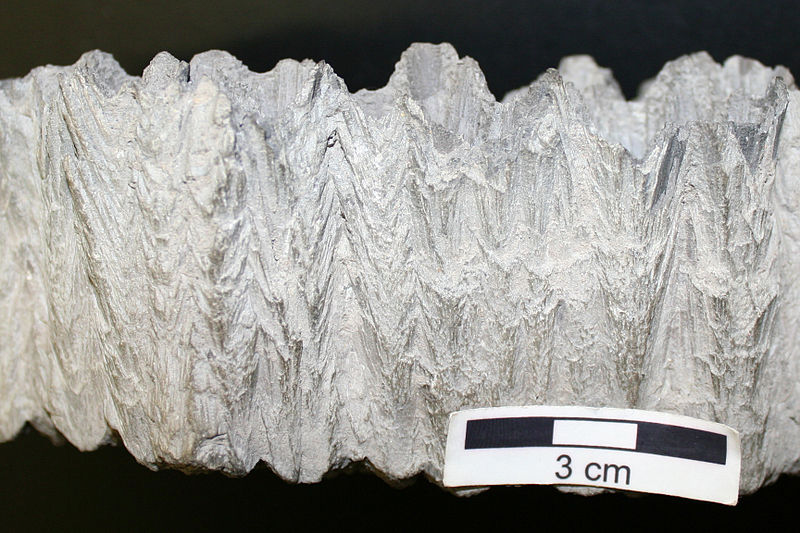 Shatter cones are conical fractures with typical markings produced by shock waves, and they belong to the regular macroscopic shock inventory in rocks of impact structures (Fig. 1). Fig. 1. Shatter cones in granitic rocks, Rochechouart (France) impact structure. They have been observed in rocks shocked in explosions of nuclear tests and have experimentally been produced in the laboratory. The required shock pressure is estimated between roughly 20 and 200 kbar (2 and 20 GPa). In general, the apex of the cones points to the shock source, but irregular orientations (Fig. 2) and even counter orientation (Figs. 3, 4) are frequent. In impact structures, the size of the cones is between centimeters and meters. Fully developed cones are rare which is explained by rock inhomogeneities. In the extreme, shatter cones may degenerate into shatter cleavage (in slaty rocks). Fig. 2. Shatter cone negative fracture markings showing strongly varying orientation. Kentland impact crater. Sample by courtesy of Richard Dreiser. Fig. 3. Shatter cones, negative and positive in counter orientation, in Malmian limestone, Steinheim (Germany) impact structure. Fig. 4. Two shatter cones with counter orientation. Kentland (Indiana, USA) impact structure. Sample by courtesy of Richard Dreiser. A fracture-mechanical aspect of shatter cone formation is illuminated on our website (click here). Fig. 5. 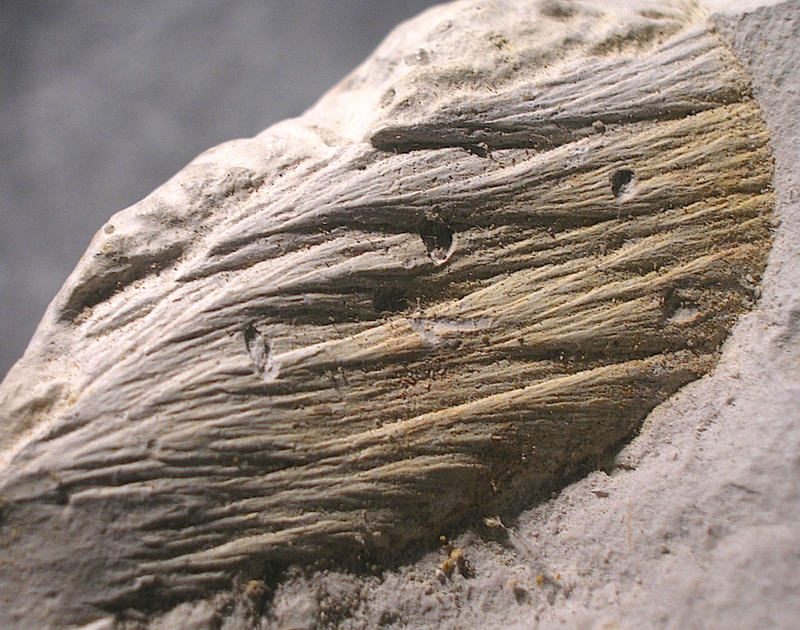 Striation – a completely different formation compared with the formation of shatter cone fracture markings. 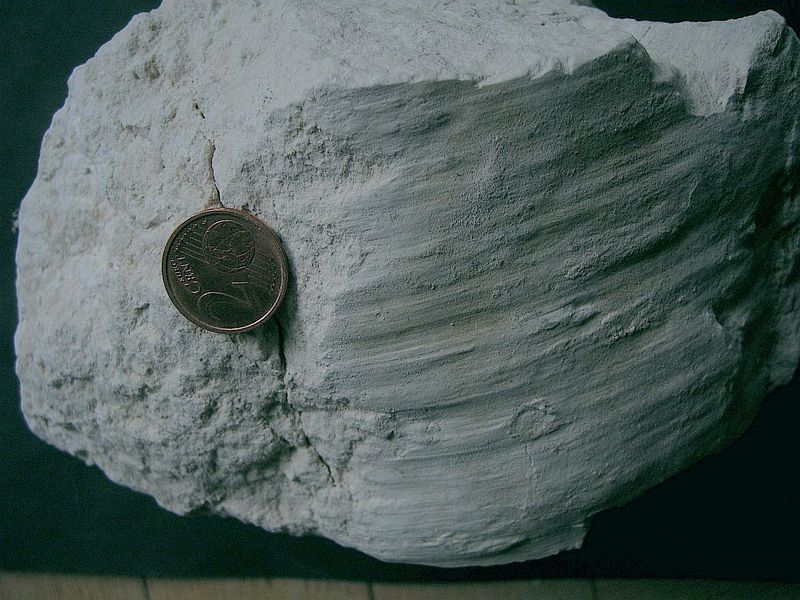 Sample from the Rubielos de la Cérida impact basin. With regard to fracture mechanics and terminology it should be noted that very often, not to say regularly, the shatter cone markings are misleadingly described or termed as “striations” or “striae” (even by established impact researchers, see, e.g. in the articles referred to above) which should basically be avoided. Also in the poorly written Wikipedia page on “Shatter cone” the misleading term “striae” can be read. “Striations” (Fig. 5) in the geological sense are parallel grooves and scratch lines formed by relative rock displacements during faulting or the movement of glaciers revealing the movement directions. Since striations are a common feature also in impact structures (from rock movements especially in the excavation and modification stages of cratering) the confusion of shatter cone fracture markings with striations is especially annoying. 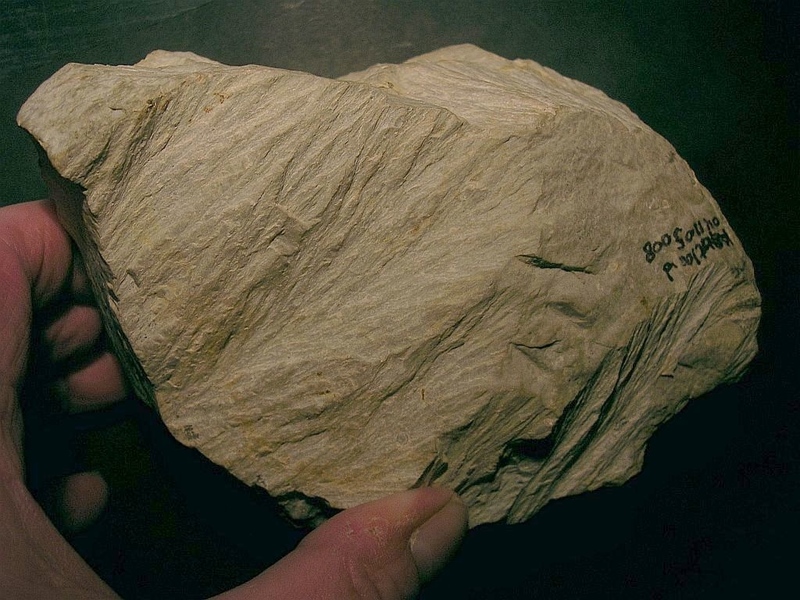 Often, apart from the misnaming term “striation”, various cone-shaped sedimentary, diagenetic and weathering features have mistakenly interpreted as shatter cones. 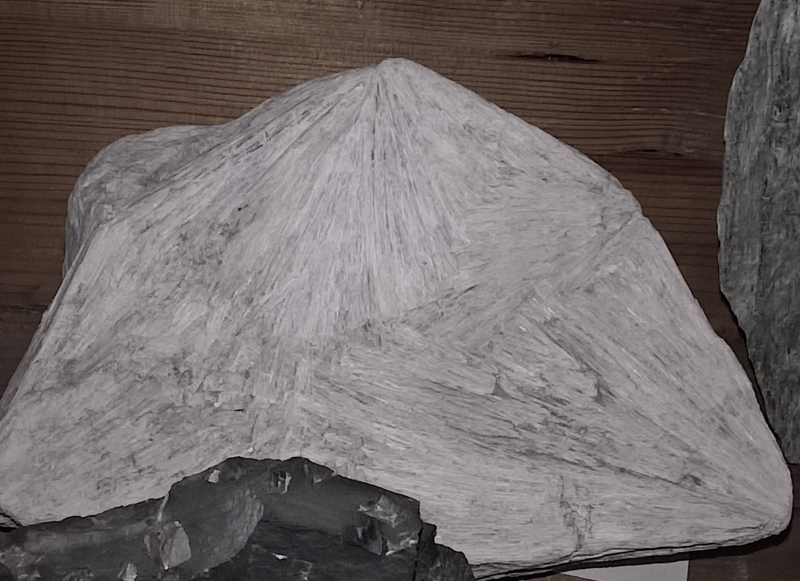 Among the misinterpretations, the cone-in-cone diagenetic structures mostly developed in limestonesand and fibrous calcite crystallization are in the first place to be mentioned (Figs. 6, 7). Fig. 6. Typical diagenetic cone-in-cone structures in limestone. Image by courtesy of Rygel, M.C (Wikimedia Commons). In contrast to true shatter cones they can easily be debunked by their in general fibrous internal structure. 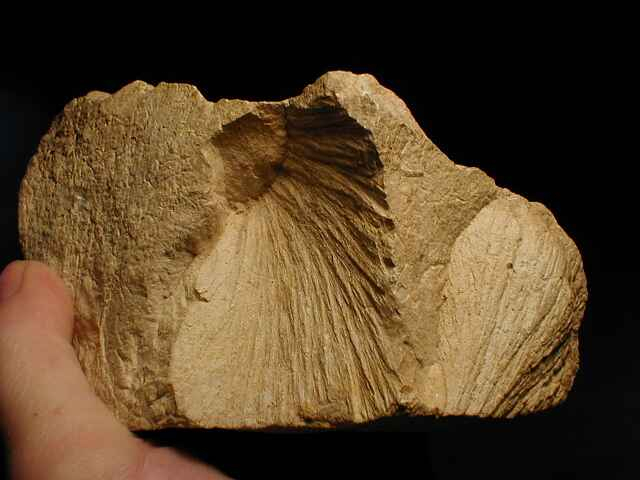 Once recognized, true shatter cones will not any longer be confused with regard to their distinctive fracture markings (Fig. 7.) reminding of a horse tail, and the two-dimensional conical fracture (Fig. 8). Fig. 7. 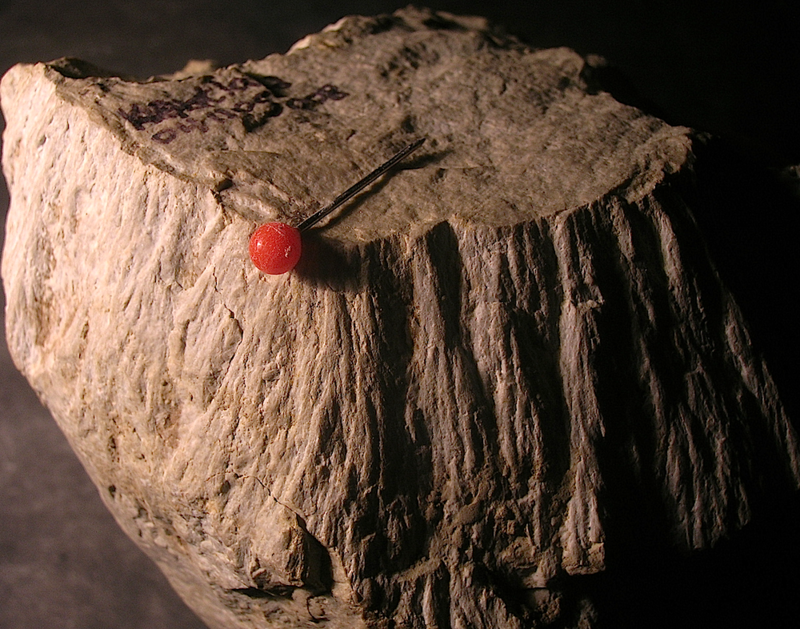 Close-up of shatter cone fracture markings typically reminding of a horse tail. 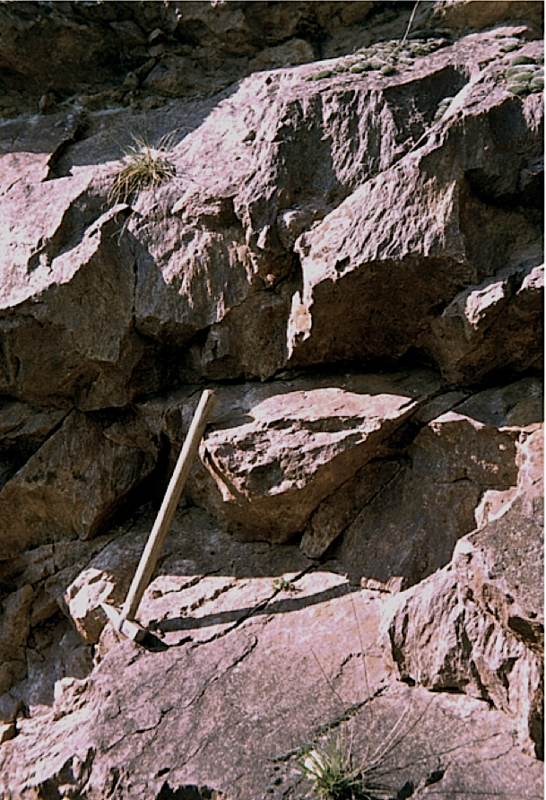 In coarser-grained rocks the fracture markings may become more rugged. Fig. 8. 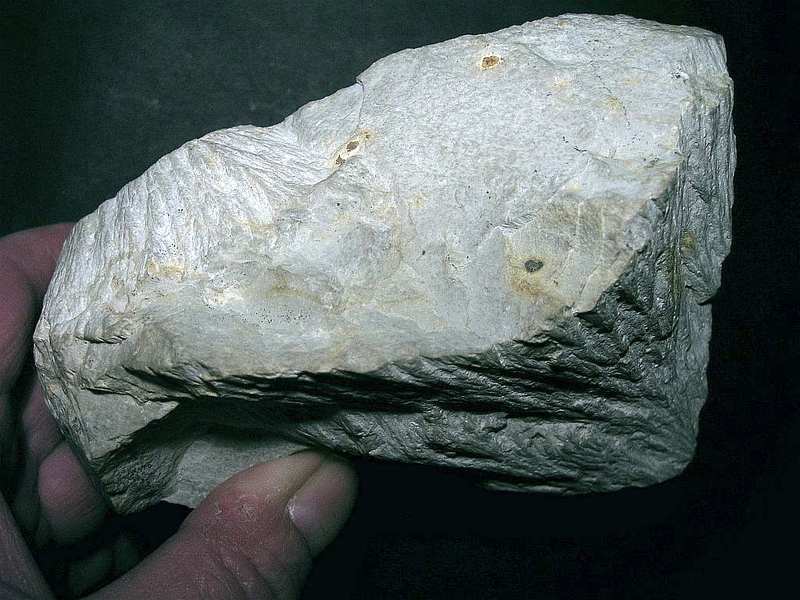 The truncated cone area of the shatter cone has not any internal structure apart from the quite normal limestone texture, which is basically different from cone-in-cone diagenetic features with their fibrous internal structure.